Doesn’t he look lonely? That’s because a heron took nine of our smaller goldfish the other week. We nearly gave up on our fish but decided to have one last “go”.Finding larger-sized goldfish was, surprisingly difficult, and in the end we chose four seven inch Koi. The large fish immediately made for them as did the surviving little one. We are keeping our fingers crossed and have placed those circular “disks” on the pond surface in the hope it deters any passing heron. Meanwhile the Koi are keeping to the bottom of the pond. Best place att he moment! He certainly does what a shame your fish has been taken . I hope your new fish do well and hope those disks work. Lovely photo. not sure larger fish will deter as far as they are concerned a larger meal ,some years ago I had a similar problem and inserted a number of canes in the ground around the perimeter and wound a number of lengths of fishing line across the pond that seemed to work ,as soon as they touched it they took off again. Your fish need a hiding place. They will look for cover when danger is lurking about. Some broken pots or building a simple cave with rocks or bricks will give them a fighting chance against predators. The lily pads aren't enough. We had the same problem with our pond in last house, we did the same as Brian with the fishing line and that seemed to have worked. Also as Bathgate said, gave them lots of little hiding places. Your pond does look lovely. :-). We had a heron in the mornings and I was told to try a childs plastic wind mill on a stick, herons do not like the movement. I pushed one in to the edge of the pond and it has worked very well. Oh brilliant ideas! Thank you ALL. I did consider a scarecrow near the pond but guess the heron would get used to it not moving. A windmill is a better idea. We have concrete all around the pond edge so the fishing line solution not that easy. We have a "heron" at the edge but Younger Son pointed out that in the mating season (now?) it's an attraction! The pond is quite deep and there are pots at the bottom so there are hiding places but the heron seems very patient. We had problems with mink once. There was a mink "farm" at a nearby town and animal welfare people set the creatures free. I have also in the past seen a large grass snake in the pond. wow Eirlys! Your pond is a wildlife haven! Watch out, you'll have camera crews there next! ;) I hope you have success with all the ideas above. I like the windmill idea. I use them to keep the pigeons off my cabbages and so far it has worked. At least you don't have to worry about hawks; or do you? Lol Bathgate, here we have to worry about Buzzards (Buteo Buteo), not the same as US. Worried about the cat sometimes. See at least 5 above my house most days all year round. We also have the mink problem here Eirlys, one of my friends lost all her ducks to them. BJS: Seriously considering the fishing line idea! Bathgate & Jen: Three extra pots now being washed before placing in the pond. Every little hiding place should help. We have buzzards and they are BIG! They circle in the sky and look like vultures. I check where the cat is. DRC: Definitely getting a windmill! Thrupennybit: Don't like the plastic disks on the pond surface but they are green and not too obtrusive. At the moment the new Koi are keeping disappointingly at the bottom of the pool. They have pretty tails and are forever on the move. Kio s do tend to stay at the bottom at intervals Eirlys. The theory behind the have two herons beside the pond is, there is already a pair in residence so don't think (the heron) about encroaching on our space! Of course it doesn't work, but your's looks lovely anyway. The Herons need a space to land, they won't land on water itself as they don't know how deep it is, so land and then wade in if shallow enough. They give it a go on matted vegetation as long as they have room to take off again. Our pond is strung with lovely white string (very decorative) as we had daily visits in the early morning, just after dawn. They also take big fish, eyes bigger than their belly, and having stabbed them then can't lift them, so you end up with a dead fish anyway. Very sad. The windmill sounds good as long as it doesn't stop the little birds from their bath. Honeysuckle: The pond is too deep for birds. We have water access in other places though they seem to prefer dirty puddles when it rains. Not happy to hear about the taking of the larger fish. That is sad. TPB: Seems as if the Koi are being very wise. In a large tank the Koi congregate at the top funnily. Hi Honeysuckle the windmill does not bother the garden birds feeding at the birdtable or the birdbath both of which are quite near. The movement of the windmill is activated by the Herons arrival and stops them landing. well after being away on holiday I have come back to find over half of our fish gone. the culprit as we saw the first morning back is a herring gull! it was floating on the surface fishing quite happily. Herons have never been aproblem as it is a raised pond and herons prefer to walk into the water and wade slowly through the shallows. I was at the garden center today and saw tadpoles aka polliwogs. They were cute with their little legs developing. SeaburnGirl: My sympathy. Know just how you feel! Wonder if a cat cut-our would help. Now that's a thought! I have a largish wooden "flat" cat I bought on impulse on holiday, though perhaps one of a lion would be better. 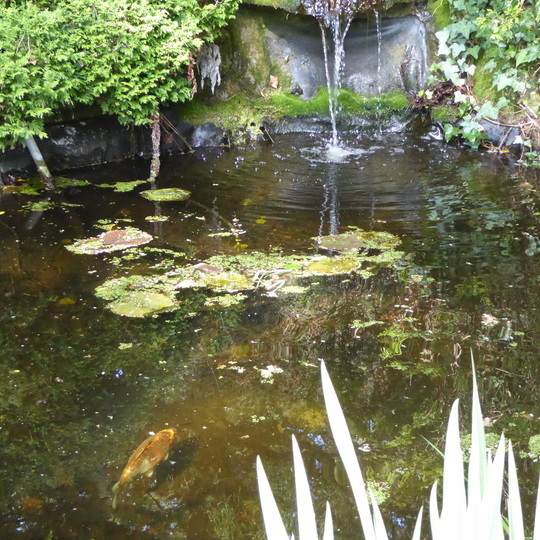 Bathgate: No tadpoles though we used to have them and newts when we had a small pond in the front garden. Quite a few toads. I posted an image of one a couple of years ago. He was a handsome fella who appeared at the front door one day.